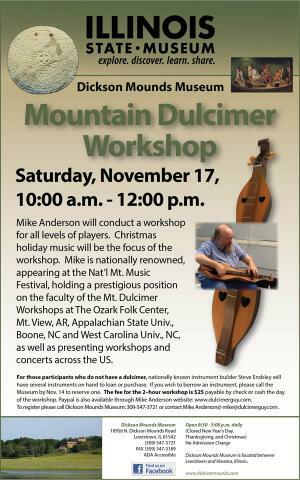 A Mountain Dulcimer workshop will be held Saturday, November 17th from 10:00 a.m.-12:00 p.m. Mike Anderson will conduct the song workshop for all levels of players. Christmas holiday music will be the focus of the workshop. Mike is nationally renowned, appearing at the Nat’l Mt. Music Festival, holding a prestigious position on the faculty of the Mt. Dulcimer Workshops at The Ozark Folk Center, Mt. View, AR, Appalachian State Univ., Boone, NC and West Carolina Univ., NC, as well as presenting workshops and concerts across the US. For those participants who do not have a dulcimer, nationally known instrument builder Steve Endsley will have several instruments on hand to loan or purchase. If you wish to borrow an instrument, please call the Museum by Nov. 14 to reserve one. The fee for the 2–hour workshop is $25 payable by check or cash the day of the workshop. Paypal is also available through Mike Anderson website: www.dulcimerguy.com. To register please call Dickson Mounds Museum: 309-547-3721 or contact Mike Anderson @ mike@dulcimerguy.com .